A falling film evaporator is a industrial device to concentrate solutions, especially with heat sensitive components. 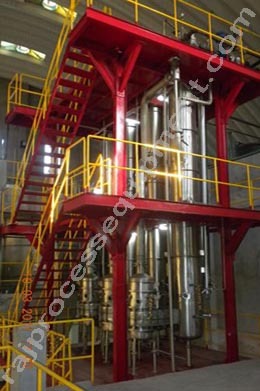 In falling film evaporators the liquid product usually enters the evaporator at the head of the evaporator. The product is evenly distributed into the heating tubes. A thin film enters the heating tube and it flows downwards at boiling temperature and is partially evaporated. In most cases steam is used for heating the evaporator. The product and the vapor both flow downwards in a parallel flow. This gravity-induced downward movement is increasingly augmented by the co-current vapor flow. The separation of the concentrated product from its vapor is undergoing in the lower part of the heat exchanger and the separator. Features of RAJ F. F. E.
They are suitable for operation at low temperature differences. 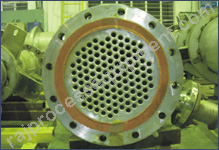 The process fluid to be vaporized is feed to the evaporator at the top of the tube sheet. A suitable distribution unit is necessary in order to achieve an even liquid distribution. It is paramount that for this process minimal wetting rate is achieved. and 300C. The film heat transfer coefficients are in general high, and characterised by surface boiling. Product residence time can be very short, especially in one through operation. 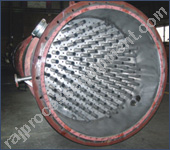 These characteristic of short retention time low operation pressure and small required effective mean temperature differences makes this type of evaporator particularly suitable for concentration of heat sensitive liquids. The absence of nucleate boiling under normal operation conditions, and low temperature differences also reduces possible fouling tendencies.